Winter is Puerto Vallarta’s high season when the temperatures are perfectly warm. The weather is not too hot, and it is reliably sunny. This is the main reason why so many snowbirds make their way to Puerto Vallarta when the frost descends on their hometowns. At the same time, summer is an overlooked gem in Puerto Vallarta! The atmosphere gets even more laid back in summer, and if you can take the heat, it’s also less busy at this time of year. Plan to spend your next summer break in Puerto Vallarta on board a private charter. Warm Weather – Those who are partial to swimming in the sea but don't like cold water will be pleased by the inviting ocean temperatures found in Puerto Vallarta during the summer months. The temperatures are high, the days are long and sun-filled, plus there's plenty of cultural activities and beaches to explore – the perfect place for an early summer break. The pleasantly warm waters make perfect conditions for many water sports activities. A summer vacation in Puerto Vallarta means that it is never too cold to get wet in the ocean. Scuba Diving – Puerto Vallarta is considered as one of Mexico's top scuba diving destinations and the certified divers have a golden chance to explore some of the most popular dive sites in Banderas Bay. Sea life is abundant and diversity of the bottom structure is quite attractive. Further, some sites feature drop-offs, shallow reefs, sloppy bottoms, small shallow coves, pinnacles, volcanic rock formations, and drift diving. Meet whales, dolphins, marlin, sea turtles, and a wide array of tropical fish. Spectacular Beaches – The palm tree-dotted along the shoreline overlooks the idyllic waves of the sea, and the golden sand makes Puerto Vallarta the perfect destination for your next vacation escapade with family or friends. The countless stretches of pristine coastline all along the waters of Banderas Bay create an idyllic setting. Enjoy a leisurely stroll on the beaches and take in the eye-captivating views of the sunset and the bountiful greenery all around. Snorkeling – Puerto Vallarta snorkeling is a popular activity that everyone can enjoy. You can also take a Puerto Vallarta private charter to a hidden island to participate in an amazing snorkeling escapade. The warm Pacific waters allow for snorkeling year round. There is an abundance of marine life that will excite even an experienced snorkeler. Look for giant manta rays, dolphins, sea turtles and schools of tropical fish. You can also spot angel fish, cornet fish, puffer fish, along with moray eels, spotted eagle rays, and starfish. Dolphin Swim – Nobody wants to miss a chance to swim with the dolphins while in Puerto Vallarta. It is one such activity that is sure to please everyone regardless of the age. The program has been designed for non-swimmers. The professional guide will brief you about the physiology, anatomy and history of the bottlenose dolphins. Everybody regardless of the age and experience can be part of this adventure. The participant will interact with the dolphins underwater. Mask, ﬁns and snorkel provided. Fishing – Located on the southern Pacific Coast of Mexico, Puerto Vallarta is a predominantly seasonal fishing destination. Yellowfin tuna season begins in June and continues into November with fish up to 400 lbs caught here every year. Every year humpback whales make their way to Vallarta to bear their young. You can also spot giant manta rays, sea turtles, and dolphins. Pacific Sailfish are consistently available throughout the year. The anglers can also end up catching black marlin, blue marlin, dorado, and wahoo. The tropical landscape which surrounds the town of Puerto Vallarta offers eye-captivating vistas to the travelers and locals alike. The summer rains in Puerto Vallarta are spectacular as you get to witness the wonderful lighting storms which illuminate the night sky with dazzling displays often out over the ocean. 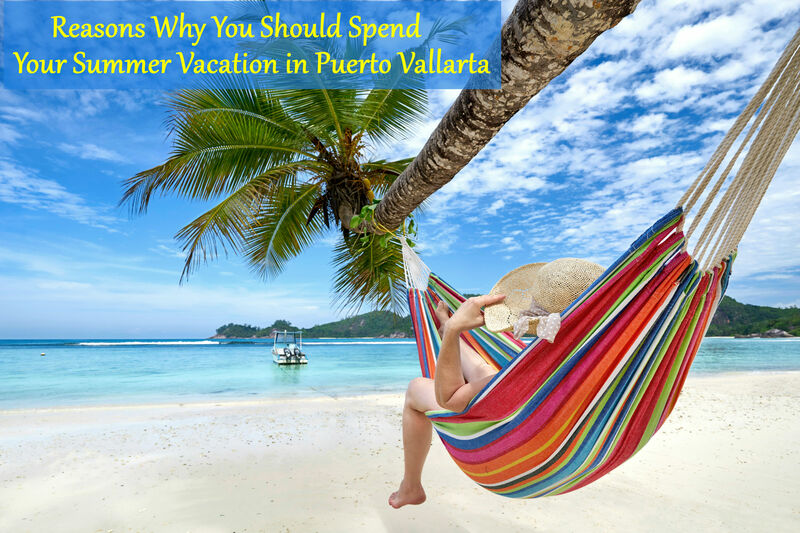 The above-enlisted reasons are more than enough to convince you to plan your next summer vacation in Puerto Vallarta. Book your Puerto Vallarta private charter in advance and enjoy a memorable vacation.